Available for purchase: Fall 2011. Learn more about the book on the Continuum website. 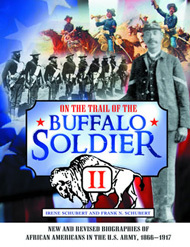 If you are interested in Buffalo Soldiers - black soldiers who served in the Regular Army between the Civil War and World War I - as more than just soldiers, take a look at these books. They focus on the soldier's lives, rather than just their military campaigns. You will learn who they were, where they came from, what their families were like, and what became of them after the Army. All of these books reflect this concern and emphasis on the buffalo soldier as a complete human being, not just as a soldier.